Preheat your oven to 180’C / 350’F /Gas 4. In a large bowl sift together the gluten-free flour, xanthan gum, bicarb of soda, salt and ginger. Rub in the dairy-free margarine until it resembles breadcrumbs then stir in the sugar. In a separate bowl, beat together the egg and golden syrup then pour into the flour mixture. Mix to make a dough, then knead lightly on a floured surface to bring together. 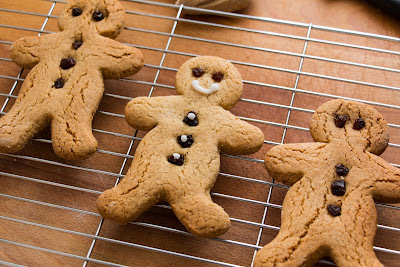 Roll the dough to about a ¼ inch thickness, then cut out gingerbread men shapes with your cutter. Bake for no more than 10 minutes. Allow to cool for 10 minutes then place on a cooling rack.